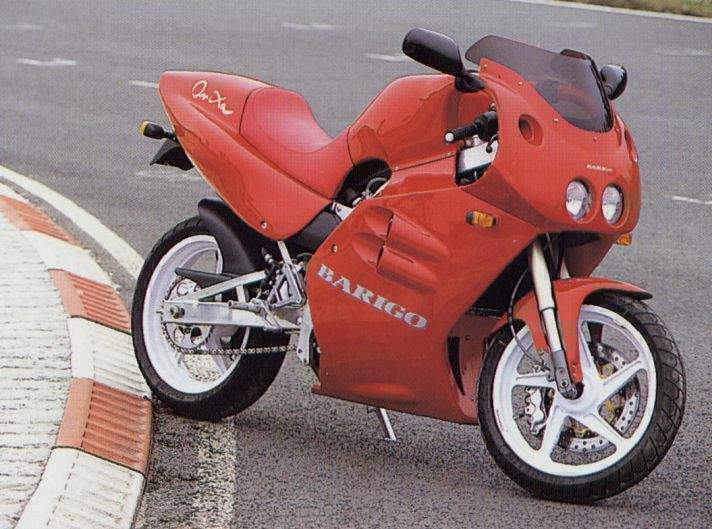 They may not be up there with the Honda's and Suzy's of this world, but back in 1994 French manufacturer Barigo seriously impressed Roland Brown with its new sportster, the Onixa. a bike whose grunt, agility and light weight proved an addictive combination. It's strange that France has almost no recent history of motorbike production. Nobody who's been among the mad motards at Le Mans or the Bol d'Or will need reminding that the nation is mighty keen on powered two-wheelers. And the French know a bit about building fast and stylish vehicles, too, as Concorde, the TGV and Renault's various F1 racecars not to mention Serge Rosset's ROC Yamaha GP bikes have proved. But although firms such as De Dion and Werner were among the pioneers of motorbike manufacturing as far back as the 1880s, the French industry sank deep into the merde after that. You've got to feel sorry for a country whose best-known production bike of recent years has been the pedal-assisted Velosolex and even that's not built any more. Bigger roadsters have been limited to car-engined dinosaurs like the BFG and Boccardo, and hand-built specials from the likes of Moto Martin, Godier Genoud and Boxer Bikes. Enter the Barigo Onixa, a sportster that could put the French bike industry back on the map. Its engine is Austrian and its styling is a little eccentric well you'd expect that of the French, I guess. But this is a well-built modern motorbike intended for production in numbers of up to 300 this year, and it could be the start of something much bigger. If Barigo can get the authorities such as the police interested (mainly in the GT600 roadster derivative planned for next year (1995) ), they hope to produce ten times that number in a couple of years' time. Things have happened fast at Barigo since October 1992, when the small bike company from La Rochelle on France's west coast, founded 17 years ago by former motocrosser Patrick Barigault, was taken over by the industrial machinery manufacturing firm Perrotin Automation. Under Barigault's control Barigo had risen to prominence with a series of wins in the Paris-Dakar Rally's Marathon class, and in national level supermoto racing. In '92 Barigault had also built a roadgoing replica of his supermoto bike, retaining the racer's combination of Rotax single engine and twin-beam alloy frame. The roadster was stunningly light and agile, and very fast for a single. Despite creating plenty of interest its production was delayed, but the SM600 finally went on sale last November, through a chain of 35 Barigo dealers across France. Meanwhile, under Perrotin's control and with Barigault retained as manager of the R&D department, Barigo's 12-strong workforce had been developing other bikes using the same engine and frame as the supermotard. The Onixa was revealed at last autumn's Paris Show. Finished all in black like the precious stone after which it was named, the curvaceous Show bike was memorable for its air intakes running dramatically over the handlebars to a high-level fuel tank. Four months later the first working prototype was painted a more familiar red, but looked every bit as striking as Barigo's men checked it over before my test at a twisty little racetrack outside Bordeaux. There's no denying that from some angles the Onixa is distinctly strange, its bodywork rising almost to the height of the screen in a manner that brings to mind that other famous French single, the hunchback of Nôtre Dame. The shape evolved from the need to add to the supermoto's fuel capacity, which is barely over two gallons from a tank beneath the seat. The Onixa's extra high-level tank almost doubles the capacity, and the plastic bodywork covering it leads smoothly into the ducts that feed air to the pair of 36mm Dell'Orto carbs. 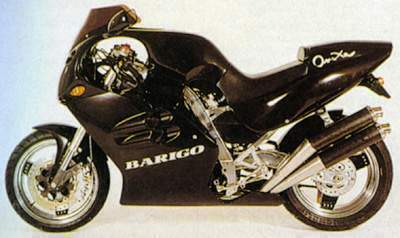 The Barigo's frame is also unchanged, its curved aluminium main spars owing more to Suzuki's GSX-R than to other singles. The frame itself weighs just 7kg, designer Patrick Barigault says, and you can believe him when he adds that it's mighty strong. The swing-arm is also in aluminium. It is 30mm shorter than the supermoto equivalent, triangulated for extra rigidity and slightly curved on the left to clear the Onixa's shotgun pipes. It operates directly on a diagonally placed, multi-adjustable WP unit, with the same Dutch firm's 40mm upside-down forks in place up front. Other cycle parts are equally purposeful, including the wide 17-inch wheels and Michelin Hi-Sport radials. The prototype was fitted with a 110/70 front tyre and a 150/60 rear on magnesium rims from Tecnomagnesio of Italy. Barigo are considering a 160-section rear tyre for production bikes, which might use slightly heavier but cheaper aluminium Marvics. But there will be no change in the brake set-up: a single 310mm front disc with six-piston Beringer caliper, and a 220mm disc at the rear. The prototype also differed from production models in its clocks, which will be replaced by conventional round dials, and its lack of a few finishing touches such as grills for various holes at the front and sides of the fairing. The internals of the carbon-fibre silencers were missing a little sound-deadening material, too, judging from the volume of the deliciously deep boom as the Onixa burst into life. For a single the Onixa felt quite tall, mainly due to the tank that came quite close to my chest as I reached forward to the clip-on bars. The seat is fairly high, too, which helps give reasonable leg-room, but the bike is so slim that short pilots would have no problems touching the ground. One other key number is decidedly small: the dry weight figure, which Barigo estimates will be around 150kg on the production Onixa. Given a crack of throttle, that lack of weight helped the Onixa leap forward with a force that immediately felt mighty strong by big-single standards. Barigo's supermoto roadster is virtually a racer with lights and an electric starter, and the Onixa had much the same raw, exhilarating competition-bike feel as I began circulating the twisty, approximately mile-long circuit. There was instant grunt available anywhere above about 3000rpm, with no noticeable step in the delivery just a steadily growing sense of acceleration all the way from there until power started dropping off approaching the nine-grand limit. On the straight running down one side of the track, the Barigo thundered up to an indicated 110mph, with a little more to come. At speed it was totally stable and surprisingly comfortable, the humpy tank meaning I had to look over, rather than through, the short tinted screen. When flat on the tank, a slight drumming on my chest left no doubt that this was a single-cylinder engine. Like BMW's F650 unit, the Onixa's Rotax engine is fitted with a balancer shaft, but the higher state of tune takes its toll in that the solidly mounted motor's vibes could be felt through seat and footpegs, particularly at higher revs. On the track I was constantly moving about in the seat, and so busy that I barely noticed. After a few dozen miles on the autoroute it might have been a different story. This bike wasn't built for droning along motorways, though, but for caning down twisty roads and round racetracks, where its light weight, frame rigidity and classy cycle-parts come into their own. The Bordeaux circuit is basically oval in shape, with a long 180-degree curve at each end and a series of tight wiggles all down one side. Through these, the little bike was brilliant due to its ability to change direction almost instantaneously with a light nudge on the bars. Putting the second fuel tank so high has inevitably raised the Barigo's centre of gravity, at least when you've just topped-up. But most weight is still carried low and the Onixa was superbly flickable, even though its Steering Head Angle, which is adjustable between 24 and 28 degrees, had been set at a fairly conservative midway point. The Onixa was brilliant on the brakes, too. The blend of big single disc and six-pot Beringer caliper pulled the bike up with ferocious power, heaps of feel and superb stability deep into a turn. If anything the Barigo was at its best through the right-hand horseshoe at one end of the track, where it showed an amazing ability to change direction while cranked hard over, effortlessly tightening the bend up before shooting out with a glorious exhaust rumble from near my left boot. Suspension at both ends was taut and well damped, admittedly on a very smooth surface. Barigo might yet decide to fit a Paioli shock instead, but this WP unit was excellent. The Hi-Sports gripped like an escargot to a lettuce leaf, too, revealing that the exhaust touched down rather too early in left-handers. Even when light rain began to fall, the sticky tyres gave reassuring levels of feedback. I carried on going until the rain got much heavier but eventually pulled in, seriously impressed with a bike whose grunt, agility and light weight makes an addictive combination. Inevitably Barigo's relatively low volumes mean the Onixa, at about £7500, will be expensive when judged against mass-produced bikes with more cubes and cylinders. (Not to mention rival singles such as BMW's budget-priced F650.) Like any sporty single, too, the Onixa is bike that must be ridden on the right type of road to be appreciated. But Barigo is confident that enough riders will try this typically idiosyncratic Gallic option. The future of the reborn French motorcycle industry depends on it.